Is Russia's nuclear corporation (ROSATOM) the largest criminal organization in the universe? If not, it's close. Rosatom (formerly known as the Federal Agency on Atomic Energy, and now also known as the Rosatom State Nuclear Energy Corporation, the State Atomic Energy Corporation Rosatom, or the Rosatom State Corporation (1)), is the state-controlled Russian nuclear energy company that builds nuclear reactors (including icebreakers and -- upcoming -- floating power reactors, several of which are under construction at this time (2018)) (2). Rosatom also mines, refines, enriches and reprocesses uranium, and -- big surprise here -- makes Russia's nuclear weapons. Established in 2007, its headquarters are in Moscow. Rosatom currently has over a quarter of a million employees (3). Rosatom is the world's largest exporter of nuclear technology, with roughly 60% of the current market (4). Rosatom is building, operating or has approval for approximately three dozen reactors in Bangladesh, Belarus, China, Egypt, Finland, Hungary, India, Iran, Turkey and elsewhere (5). Expected service life for their current large power reactor series, the AES-2006, is a minimum of 60 years (6). In 60 years one reactor will produce approximately six million pounds of high level nuclear waste. It is reasonable to assume that most, if not all of Rosatom's foreign and domestic (Russia) reactors are approved through the payment of bribes. The resulting costs are usually far higher than they would be otherwise. For example, in Bangladesh, where a "deep-rooted and widespread corruption culture" exists, all types of power plants cost far more than elsewhere in the world. One study estimated the average price of a power plant in Bangladesh was double the global average. Russia is building two units in Bangladesh (Rooppur 1 & 2), due to go online in 2030, currently estimated to cost 45% more than the same style of plant would cost in Russia (7). Another country plagued by corruption -- and building and operating Rosatom reactors -- is China. China and Rosatom recently (June, 2018) signed "the biggest package of contracts in the history of the two countries' nuclear partnership" (12) to build four "Gen III+" VVER-1200 units as well as a CFR-600 fast reactor pilot project, and to supply Radioisotope Thermoelectric Generators and Radionuclide Heater Units for China's "lunar exploration program" (13). The space nuclear units will use Plutonium-238, one of the most toxic substances known, nearly 300 times *more* toxic than weapons-grade plutonium-239 (Pu-238's decay cycle is correspondingly less than Pu-239's 24,100 year half-life). How corrupt is China? "At least 12 senior-level NEA [National Energy Administration] officials have been investigated or charged with corruption in the past decade, including two directors and four deputy directors" (14). The NEA agency is only one decade old! In 2010 the former head of China's main nuclear energy company was jailed for life over bribes (15). At the current pace, China will be the leading producer of nuclear energy by 2030 (16). China will thus also be the leading producer of nuclear waste. After Fukushima, China decided to place most of its new nuclear reactors along its coast, not at interior sites, presumably so that if/when there are meltdowns, most of the radiation will be spread globally, with a much smaller proportion poisoning China itself. In 2017 Rosatom signed a "Memorandum of Understanding" with the nuclear power division of Brazil's state-owned energy companies (Eletrobras and an affiliate of Eletrobras), with the plan of building at least two reactors there (17). Brazil is now governed by a far right-wing racist president, Jair Bolsonaro, considered by many (for example, his son) to be "just like Trump" (18). Bolsonaro ran on an "anti-corruption" platform; however his campaign was accused of fraud, spreading fake news, and violating campaign finance laws (19). Recently Rosatom signed deals with Egypt to build the first nuclear power plants in North Africa. Russia will provide 85% of the projected $21+ Billion cost. Four 1200 Megawatt reactors will be located about 100 miles south of Cairo (20). The cost of Russia's loan to Egypt could swell to over $70 Billion during the 35-year life of the loan, and cost overruns are typical with all Rosatom deals (21). In India, where Rosatom has contracted to build a dozen reactors (22), India's former chief regulator was concerned that substandard parts were being supplied by Rosatom subsidiary Zio-Podolsk, after one of Z-P's directors was arrested on charges of corruption, fraud, and supplying "cheap Ukrainian steel blanks and steam generators" for the reactors at Kudankulam (23). In Finland, Rosatom took over partial ownership of the Hanhikivi 1 reactor after financial problems nearly sunk the project before it even began. It is "the biggest investment project in Finland" (24). Construction is expected to start in 2020. Originally claiming the project would cost around $5 Billion, current estimates put the total cost nearing double that, with completion optimistically expected in 2024 (25). Doubling (or worse) of the cost of nuclear reactors is so frequent it can't be accidental -- therefore it should be considered a form of corruption. One deal that Rosatom tried to make apparently fell through -- a $76 Billion scam to build ten nuclear reactors in South Africa. The arrangement "reeked of corruption" and would have represented 1/4 of South Africa's GDP (26). Rosatom makes deals that involve loaning massive sums of money to cash-poor countries, and requiring payback even if the projects are not completed on time (or ever). Most of the financial arrangements are kept secret and -- as can be seen from the above examples and many others -- most probably involve corruption, mismanagement, bribes, and other scandals. Once a deal is in place, the Russian government uses the arrangement to exercise political pressure, stopping construction until the country bends to their demands or -- as in the case in 2014 in Ukraine -- threatening to cut off nuclear fuel supplies for their Soviet-built reactors (27). And even in countries without a Rosatom nuclear power plant deal, Rosatom corruption runs deep. According to a New York Times article from 2015, Rosatom "had taken over a Canadian company with uranium-mining stakes stretching from Central Asia to the American West" (28). The sale gave Rosatom control of 1/5th of all U.S. uranium capacity in a deal signed off by then-Secretary of State Hillary Clinton, who's Clinton Foundation then received over $2.35 million in donations from four family members of the Russian company known as Uranium One (which became a fully-owned Rosatom subsidiary in 2013). Tens of millions more dollars were donated to the Clinton Foundation by "a constellation of people with ties to Uranium One or UrAsia" (UrAsia merged with Uranium One in 2007). These donations were not properly disclosed in a timely manner, despite Hillary Clinton's signing of a Memorandum of Understanding agreeing to do so (29). Rosatom pushes nuclear technology in all forms, including having built more than 120 "research" reactors around the world, representing nearly half of all research reactors (30). So-called "research" reactors, more often than not, merely train reactor operators for future jobs in industry, and many are fueled with uranium enriched to up to 20% U-235, instead of the 4% to 5% enrichment for most power reactors. Such enriched fuel is more easily converted to bomb material. In an undated page at Rosatom's web site, they claim to have adopted an anti-corruption and anti-embezzlement program which "has already contributed to building a corruption-free environment within ROSATOM" (31). The Blue Ribbon Commission on America's Nuclear Future: Advocating "Consent-Based Siting" or "Successful Hoodwinking"? In January of 2012, Obama's "Blue Ribbon Commission on America's Nuclear Future" (known as the "BRC") delivered their final report on "consent-based siting" of nuclear waste dumps in America. Their report has become a standard reference on the subject. The commission members included both a past and a future chairperson of the Nuclear Regulatory Commission (Richard "Rich Rad" Meserve and Allison M. Macfarlane, respectively), and a past chairman of the Department of Energy (Ernest J. Moniz). However, who exactly the BRC thought should be allowed to give consent, and what the ramifications of that consent on future generations might be, was never clearly stated, as I point out below with numerous quotes from the BRC report. The abominable "Shimkus Bill" (H.R. 3053), makes it even more clear what the goal really is: To limit the ability to stop a nuclear waste project once any fraction, no matter how small, of the population of a state, county, city, town or tribe has, for whatever reason, given consent to host a nuclear waste dump (and the governor of the state, for whatever reason, has approved the plan). Here is a review of the BRC's own words on "consent-based siting" of a nuclear waste dump or interim storage location. Several quotes from prior comments I have made about the BRC report appear below the review. "The Commission takes the view that any future site, provided it has met all regulatory requirements and has been selected with local- and state-level consent should require no additional approval, including congressional approval." How "local" is "local"? This sentence can be interpreted (by the courts and others) to mean that, for example, an Indian tribe of, say, eight (or less) people can constitute "local" approval, and one governor, in a lame-duck term, can approve the site, and after that, nothing can be done -- no wider communities can object, no future tribespeople can object, not even a future governor of the state can object. Indeed, the "Shimkus" bill (H.R.3053) is designed to make objecting even more difficult, so that the larger communities would be unable to prevent nuclear waste dumps near them (or even within their borders) or from traveling through them. Albuquerque and Las Cruces city councils have both passed ordinances forbidding nuclear spent fuel from being transported through their cities, which would make getting waste from California to Carlsbad, New Mexico very difficult, possibly even impossible. The Shimkus bill, designed to implement many aspects of the BRC recommendations, would overrule such opposition. "Clearly, locating and constructing facilities for the management and disposal of SNF and HLW will require complex and possibly lengthy negotiations between the federal government and other relevant units of government. In these negotiations, it will be important to define the roles, responsibilities, and authorities of host state, tribal, and local governments both throughout the siting and licensing process and once a facility is operational. In addition, host jurisdictions should have the option to enter into partnership arrangements or other legally-binding, court-enforceable agreements with the implementing organization to ensure that all commitments concerning the development and subsequent operation of waste management facilities are upheld. A similarly consent-based approach should be used in the future in deciding whether modifications to the scope or mission of an existing facility are appropriate and acceptable. " These statements also address limiting any community's ability to object to consent that may have been given, for example, by a previous, since-disgraced board of tribespeople or a corrupt governor. Once decided by one misguided (or highly bribed (with promises of new schools, high-paying jobs, etc.)) group, there will be no going back. The Shimkus bill is also designed to prevent any later rejection of someone else's approval of a bad idea. "Beyond engaging in substantive negotiations and binding agreements with other units of government as part of the facility siting and development process, the Commission believes that states and tribes should retain—or where appropriate, be delegated—direct authority over aspects of regulation, permitting, and operations where oversight below the federal level can be exercised effectively and in a way that is helpful in protecting the interests and gaining the confidence of affected communities and citizens. Such authorities could be included in legally-enforceable agreements or partnerships if such arrangements are negotiated between the implementing organization and states, tribes, and/or local communities that agree to host a waste management facility." Once again, the thrust (through the words "binding agreements" is to prevent a community from righting the wrong of once deciding it should host a nuclear waste site. Even if a "temporary" site ends up being in a community for centuries longer than was promised when it was built. "Another question highlighted in numerous comments to the BRC is the question of how to define "consent." Some stakeholders, for example, have suggested that consent within a state could be measured by a state-wide referendum or ballot question. On the other hand, the WIPP facility was sited, opened, and has been operated without the state's elected leaders employing such consent-measuring mechanisms. The Commission takes the view that the question of how to determine consent ultimately has to be answered by a potential host jurisdiction, using whatever means and timing it sees fit. We believe that a good gauge of consent would be the willingness of the host state (and other affected units of government, as appropriate) to enter into legally binding agreements with the facility operator, where these agreements enable states, tribes, or communities to have confidence that they can protect the interests of their citizens." Here AGAIN, the emphasis is on restricting the ability to stop a project once any small community has agreed to host a nuclear waste site. Also, the wording goes from "host jurisdiction" (which could be a tribe of half a dozen people (or even less)) to "state" with no stops in-between. This paragraph also shows that the BRC is NOT requiring that towns, cities or counties be able to give (or not) consent, nor a state-wide referendum, only "tribes, or communities" and the governor of a state. "The WIPP example suggests that having some degree of direct state- or local-level control (in the WIPP case, this was possible through RCRA) can be helpful in instances where faith in federal agencies is lacking." "Some degree...of control" means "not complete control." NOWHERE in the BRC final report does it state that the city (within which is contained a small piece of tribal area that has accepted nuclear waste) can object and stop the project; that a county where that city is located can stop the project; or that the state, after a (possibly ignorant, indebted, corrupted or crazy (for example, Bill Richardson)) governor has given approval of the plan, can stop the project. Furthermore, communities are not being given the ability to prevent nuclear waste from being transported through their jurisdiction if they don't want it. The whole emphasis is on NOT being able to stop the plan, because "consent" is so narrowly defined rather than explicitly including city, county, transit areas, and state (after a lone governor has agreed to the plan). All it takes is one signature at the state level to move the plan forward forever, unescapably. Challenge: Show me one place in the BRC report where a "county" or "city" is specifically given the option to object, let alone where a community can change it's mind after an accident, or if future generations realize they were hoodwinked or that a corrupt official gave the approval (for example, Private Fuel Storage (PFS) in Utah was approved by a very small set of corrupt tribal leaders (less than 10 people). The tribal community strongly objected, as did the state, and it was never built). In point of fact, the word "county" never appears in the BRC report, and the word "city" only appears once in an unrelated item on page 129. And the governor is the only state-level entity given authority in the BRC recommendations to object to -- or approve -- a nuclear waste dump. Also, nowhere in recommendations of the BRC is a requirement that the public be properly informed about just what they are accepting: What the effects of an airplane strike at the facility, or a zirconium fire after a transport accident that breaches a dry cask would be. It ONLY specifies that some tribe or "community" has given consent, nowhere does the phrase "informed consent" appear in the document. Obama's Blue Ribbon Commission (BRC) was an utter failure. Nevertheless, one of its members now heads the NRC. There's no place to put the waste. The proposed new head of the NRC was on Obama's essentially-useless "Blue Ribbon Committee" (BRC) on nuclear waste management, a committee of about a dozen people, mostly from the industry, who were charged with solving the same puzzle that tens of thousands of scientists (you read that right) at Yucca Mountain were charged with solving: What to do with the nuclear waste? The Yucca Mountain team couldn't solve that puzzle, the BRC couldn't solve it, and now she's supposed to run the agency that's in charge of making more waste that no one knows what to do with. But I don't think she's explored the idea of not making more waste in the first place! A perfectly logical idea no one seems to be able to accomplish! But San Onofre accomplished it all by themselves -- temporarily. We just want to make it permanent, and we think we have a lot of good reasons. The above report was created in response to some comments made last Friday (October 12, 2018) by a person associated with creating the Blue Ribbon Commission's report. Several stakeholders, myself included, attended a meeting on "Extreme Events." We had created a petition a few months ago and about 170 people signed on, asking for a workshop on the subject of rare-but possible catastrophic events at San Onofre Nuclear Waste Dump. Roger Johnson conceived the idea for the workshop, and did most of the work to produce the petition. Gary Headrick and myself helped out with the wording and the signature gathering. The nuclear waste siting expert told me that transporting nuclear waste is not a problem, which I strongly disagree with. He also said that the BRC advocated for "Consent Based Siting" of a nuclear waste dump in America, and as I've outlined above, I think they only use the term but have every intention of forcing the waste on some unlucky community somewhere -- at the moment, either southeastern New Mexico or western Texas. Subject: A response to Dr. Kris Singh's letter of July 16, 2018 regarding "misinformed activists"
Despite Dr. Singh's stinging and inaccurate comments in his letter of July 16, 2018, we did NOT attend three Nuclear Regulatory Commission hearings in New Mexico in May in order to "spread lies and innuendos" and "slaughter the truth with impunity." His comments are libelous and inappropriate. First of all, I stand by everything I stated at those hearings. For example, I stated at the hearing in Carlsbad that a typical 5/8ths-inch thick dry cask is approximately the proportionate thickness of an eggshell. The wall of a dry cask is about 1.6% the diameter of the dry cask. An egg shell is about 1.25% the thickness of an egg -- less than half a percent difference. And a dry cask must carry about three times the density of an egg. Dr. Singh refers to these thin-walled canisters as "unconditionally safe storage units." They are anything but! Second, as a resident of Carlsbad, California, approximately 15 miles from the largest nuclear waste dump in America (San Onofre), it would be in my personal best interest to get the waste moved and force it on New Mexico, as Dr. Singh wishes to do. However when we visited New Mexico we had a lovely time, the people were friendly, and we went to a variety of museums including the Bradbury Museum, the Los Alamos History Museum, the National Museum of Nuclear Science & History, the Indian Pueblo Cultural Center, the New Mexico Museum of Space History, White Sands National Monument and the Sky City Cultural Center/Haak'u Museum. People visiting these museums provide far more jobs and income than Holtec's nuclear waste dump could ever bring! An accident during shipment or storage would affect the attendance at every one of these museums and many others. Third, I have been studying nuclear issues for more than 40 years (I have a personal collection of over 500 books on nuclear issues, and have read scores of them cover-to-cover (both pro and con)). I have interviewed and corresponded with dozens of nuclear scientists, nuclear physicists, and medical doctors who have educated themselves about nuclear issues. 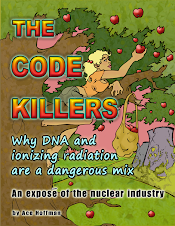 1) My own book on nuclear issues, called The Code Killers. The title refers to the destruction of DNA by radioactive substances. I wrote The Code Killers during a three-month period after learning that I had bladder cancer about 13 years ago. Bladder cancer is sometimes a fatal disease and I wanted to make sure the things I learned could be passed on to others. I have made the book available at no charge online at my personal web site ( www.acehoffman.org ) and gave out approximately 150 copies while in New Mexico. If you look at the book, please note especially page 17, which discusses radioactive plumes after an accident, using charts by various scientific organizations and committees to show how far the radionuclides can spread. Carlsbad Caverns, which we enjoyed prior to the Carlsbad, New Mexico NRC hearing, would probably have to close permanently after an accident either at the Holtec site or during transport to/from the site. Albuquerque, Santa Fe, and Las Cruces might all have to be abandoned, along with every town between those cities and the Holtec waste dump. Please note with reference to that article that, despite Dr. Singh's entirely undeserved and inaccurate comments about "outsiders" who "don't have a stake in the local community" it is he, and his team, who have been misleading the citizens of New Mexico about jobs and financial benefits of the Holtec waste dump, as well as about the dangers of nuclear waste storage, AND, most of all, about the long-term prospects for how long the waste will stay in New Mexico. When I attended the hearings, I gave copies of the neutralization essay to Holtec's most technical specialist present, who assured me he would review the document and make any critical comments he had. After nearly two months, he has not made any comment whatsoever. This should hardly be surprising because it's a MUCH better plan! Neutralization eliminates the risk of a criticality event, which is the most serious concern regarding spent nuclear fuel. (For example, San Onofre's chief of nuclear operations, Tom Palmisano, has stated that preventing a criticality event in the fuel is the #1 priority of spent fuel management.) Neutralization also reduces the storage requirements from hundreds or even thousands of millennia to approximately half a millennia -- which is still a long time, but less than 1/2 of 1% as long as is required for untreated spent fuel. Neutralization also eliminates the possibility of later separating out the fissile materials for use in a nuclear bomb (otherwise that danger exists for the full length of time the waste is hazardous). These are only some of the benefits, others are included in the essay. If Dr. Singh's biography (included in his letter to you) included a medical degree in radiation hazards, his views on the dangers of his plan to move all the nuclear waste in America to New Mexico might be more meaningful. If he concerned himself with the statistical dangers of transport by rail (such as the two derailments in eastern New Mexico last weekend) one might "buy" his plan to simply "return to sender" any canisters which arrive damaged after transport to the Holtec waste site. But that would require the damaged waste to be transported not just twice (once to Holtec and later to a permanent repository, AFTER it has had decades or even centuries to corrode its containment and fracture its zirconium cladding) but at least FOUR times, perhaps thousands of miles each time, over a national rail system which is already in sore need of trillions of dollars in infrastructure improvements. But instead of concerning himself with the real dangers of his plan, and the alternative -- neutralization -- Dr. Singh chooses to ignore the dangers on the pretense that his solution is the "best" for the country regardless of any risks it has. But in fact, the nuclear industry's biggest mistake has always been to promote the idea that there are ANY good solutions to the nuclear waste problem, and "if you build it, more will come." Nuclear waste deliveries to New Mexico won't end with what is already in storage around the country and in the reactors at this time. Instead, the nuclear industry will pretend -- until there is a serious accident, that is -- that Holtec's New Mexico waste dump has "solved the nuclear waste problem" and will use it as an excuse to relicense old reactors AND build new ones, including "Small Modular Reactors", which will mean it won't stop at 100,000 tons of nuclear waste, but eventually another, and another site will be needed for ever-more nuclear waste, all because New Mexico agreed to be the radioactive killing fields of America. Is that the legacy you want to leave to your children, their children, their children's children, and so on for thousands of years? I hope not. My long time friend, stakeholder counterpart Roger Johnson (from San Clemente) seeks signatures from San Diego stakeholders on his Petition for San Onofre stakeholders in reactor communities to request a Special CEP Panel Meeting asap, due to the urgency of Edison's ongoing progress to place HOLTEC Umax containers of spent nuclear fuel into ISFSI, located partially underground on exposed coastline at San Onofre. The digital file containing the Petition (prepared by Roger Johnson) is contained in digital file attachment. Roger Johnson is professor emeritus, with decades of experience, and technical expertise on San Onofre public health and safety issues. Please preview proposed Petition at earliest opportunity. If you concur and wish to sign via electronic signature, please respond directly by email to Roger Johnson, to notify him of your consent to use electronic signature for the CEP Panel Petition, by remote users in San Diego County. Roger is collecting signatures from stakeholders in Orange County, and LA County. If you know others in San Diego, or Riverside, or Imperial counties who would like to sign, please SHARE. Edison is now starting to move the remaining highly-radioactive uranium and plutonium nuclear waste from cooling pools into thin canisters to be stored at ground level near the beach in San Onofre. The 3.6 million pounds of deadly nuclear waste are an enormous threat to the 8.7 million people from San Diego to Los Angeles who live in the 50 mile radius (the recommended evacuation zone at Fukushima). Some of this waste will remain lethal for hundreds of thousands of years. When SONGS was built, promises were made that the dangerous nuclear waste would be safely removed. The current plan to store this waste in the middle of two metropolitan areas for the indefinite future is irresponsible. (1) What are the possible threats to this area, including worst case scenarios? (2) How will the public learn about actual radiation levels in the event of an incident? What are the consequences of radiation exposure and radioactive contamination to life and property? (3) In the event of a radiation emergency: (A) What will authorities do? (B) What can members of the community do to protect themselves from radiation? (C) How can the public be educated and be made aware of these serious issues?